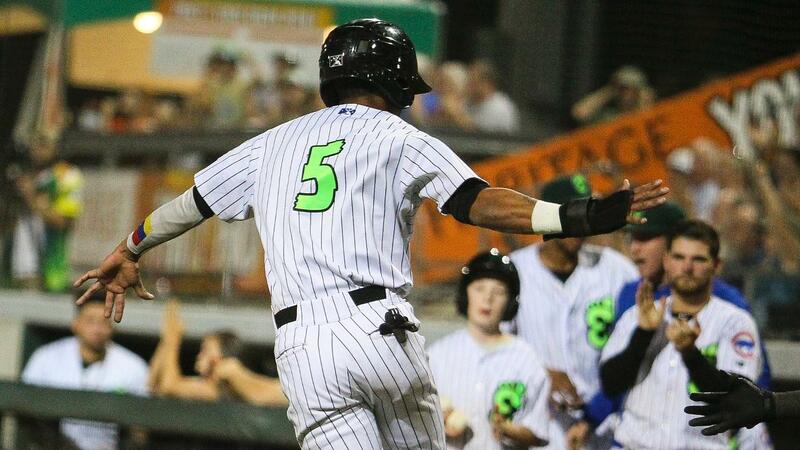 Eugene OR - You don't have to tell the Eugene Emeralds that in the playoffs, you can throw out the record book. They got into the playoffs owning the worst record in the league. So, when the team owning the best record in the league comes to town, the Ems expect something crazy to happen. That something was a balk called with a runner at third, giving the Ems a 3-2 lead they would not relinquish in front of 3,038 at PK Park in Game 1 of the NWL Divisional Series. Eury Ramos took the hill for the Ems (1-0) to start the playoffs but struggled out of the gate by allowing a walk on four straight pitches to open the game. Jake McCarthy was caught stealing during the next at-bat, and Ramos got out of the inning unscathed. He was not as lucky in the second, when he left a 2-1 pitch up to Andy Yerzy and watched as Yerzy turned on the ball to put it on the roof of the PDA for a 1-0 Hops (0-1) lead. Ramos then allowed a double to Joey rose before stranding him on third. Hillsboro added one more in the third when Jorge Perez walked and came around to score two batters later on a Geraldo Perdomo triple to make it 2-0. Ramos' day was done after that, giving up three hits and two runs over 2.1 innings. He also walked a pair and struck out four. Eugenio Palma came in relief of Ramos and got a pair of shallow fly outs to strand Perdomo at third. Palma then pitched around a 2-out double in the fourth before striking out the side in the fifth. It was in the bottom of the fifth when the Ems finally broke through Luis Vazquez singled and Grant Fennell walked with one out. A wild pitch moved the runners to second and third and Nelson Velazquez hit into a fielders' choice, scoring Vazquez and cutting the lead to one. They took the lead in the sixth, when Levi Jordan led off the inning with a walk. After a Jonathan Sierra fly out, Jordan moved to second on an errant pick-off attempt. Jake Slaughter stuck out before Fernando Kelli singled to right and scored Jordan to tie the game at 2-2. A Caleb Knight single on the next pitch brought Vazquez up with the game on the bases. A wild pitch led to Kelli standing at third while Vazquez fought off pitch after pitch, eventually leading to reliever Ryan Weiss to balk Kelli home and give the Ems their first lead. It was finally on the 11th pitch of the at-bat that Vazquez was retired, but the damage was done. Palma's night was done after the fifth as he gave up just one hit over 2.2 innings of work and striking out five. Peyton Remy, a new addition to the Ems, got the win after following Palma and going three innings, giving up just two hits and five strike outs. Ivan Medina earned his first save with the team, pitching a perfect ninth with a strikeout. Game 2 of the 3 game series switches to Hillsboro for Thursday night. The Ems will send ace Faustino Carrera to the hill as the Hops send 2018 draft pick and former Duck Matt Mercer to the mound.